Gliding soundlessly and effortlessly, as if in a world of their own, helium balloons have fired imaginations and appealed to a sense of romanticism. 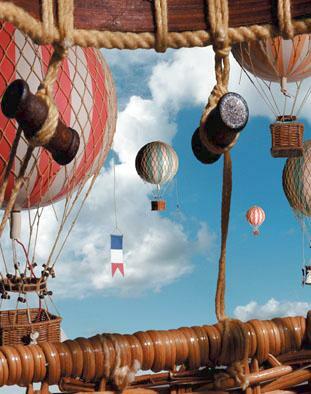 From as early as 1783 balloons have traveled the skies, often in unintended directions, but that was part of the adventure and appeal as well. Imagine the feel, viewing the earth, leaning on the rim of the basket, floating silently amoung the clouds. If you have ever seen Air Balloons floating in the sky, with magnificent vibrant colours, imagine this hanging from a ceiling, magnificent. Flying Aces such as the Red Baron and Eddie Rickenbacker. Mini wood model planes of a bi gone era fly continuously. Gazing in the night sky we wonder about the size and scope of the universe.